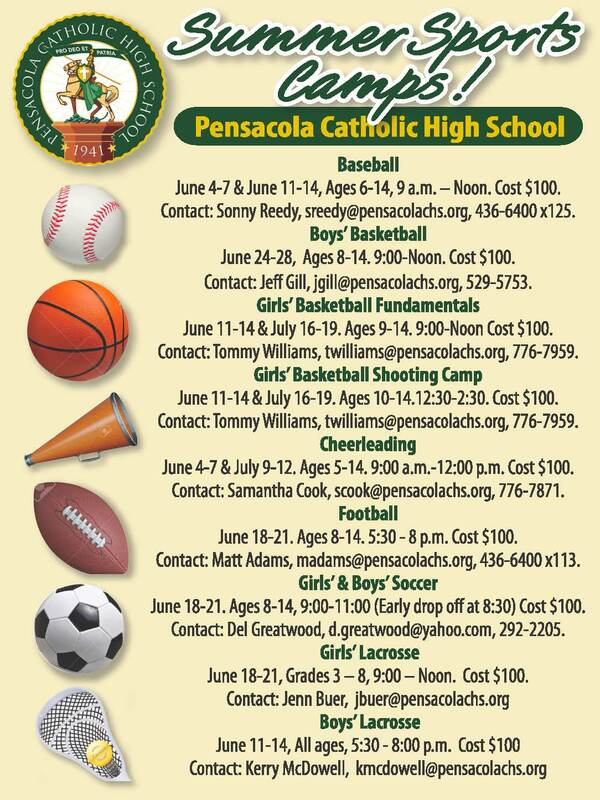 Families, you are invited to consider Good Counsel Summer Camp in Central Florida. It’s a Catholic youth camp outside of Tampa. Mr. Reding has already invited the boys bible study and public school families from the parish. So far there are several families intending to register their children. The website is goodcounselcamp.org . It’s about 6 hours away in Floral City, north of Tampa. As the website and FB page illustrate, if offers canoeing, fishing, camp fires, hiking, archery, crafts, and times of prayer. The only one-week offering is June 23-29. This is what most Sacred Heart families are considering. However, there is also a camp July 14-26. There is no group registration. You register as individual families. The best price, $370, is if you register and pay by March 1. Please let Mr. Reding know if you do register, that way he can help families carpool if they choose. Summer greetings as many of you are in the midst of vacation time with your family. The beginning of our school year is only a few weeks away, so we wanted to share the exciting happenings this summer at Sacred Heart Cathedral School. Dave and I are honored to introduce this distinguished faculty. Our pre-k teacher is Mrs. Erin Bowie. Mrs. Bowie is the mother of five children, a graduate of UWF and is totally immersed in working with our pre-k young people. Mrs. Bowie’s expertise will continue the excellence established in this program for our young learners. She also has three children that will be attending our school. Our first grade teacher is Ms. Rachel Barzen. Ms. Barzen comes to us as a recent graduate of Franciscan University in Steubenville, Ohio. Welcome Rachel as she brings her wisdom and enthusiasm from her experience at Franciscan and in the classroom. Our fourth grade teacher is Mrs. Debbie Garland. Mrs. Garland is a graduate of Regis University, a Jesuit University in Denver, Colorado. Debbie comes to us with 17 years experience as a Catholic school educator in Albuquerque, New Mexico. Debbie and her family returned to the Pensacola area to be close to her retired parents. Mrs. Garland’s room is painted, already prepared for the new school year and has a new floor. Our 6th grade home room teacher, and Spanish teacher is Mrs. Ricardo. Mrs. Ricardo is a graduate from a Catholic University in the Dominican Republic as well as having earned a Master’s degree in Pennsylvania. She is also a cultural dance teacher, so middle school will have the opportunity for a new fine arts elective. Our middle school science teacher is a current parent, Mrs. Rachel Barry. Mrs. Barry is a graduate of UWF holding both an undergraduate degree in biology and an MS degree in microbiology. She has years of experience teaching science at the high school level. Our Morning Star teacher, Mrs. Diana Susann holds an undergraduate degree from Boston College, a Jesuit University, and an MA from California State University. Both degrees are in special education. Mrs. Susann is relocating here from Bosnia as her husband is in the military. Mrs. Susann is a mom of five children; four will be at Sacred Heart and one will be at Catholic. The last change is that Mrs. Sidney Poller has moved to the front office and Mrs. Terry Sadler will become the Pre-K aide. We have been blessed with many new teachers from many diverse backgrounds, yet all centered on the same mission and vision. I hope you join us in welcoming these individuals and their families to our school community. As for our building projects…the new floor has been laid to replace the old carpet. The new floor is the same floor used at Sacred Heart Hospital so it has a positive history of sustainability. We are creating a literacy/exceptional learning room at the end of the hallway. Most exciting is that we are creating an outdoor space for eating lunch so our young people will have their own space to eat their lunch. The fence company is scheduled to begin soon so that our students will not only be able to eat outside, but this atmosphere will create an outdoor classroom that will allow the students and faculty to feel safe and enjoy the atmosphere of East Hill. The fence company is the same company that installed our fence surrounding the parking lot. While we are not installing the brick columns at this time, this is an on-going project where we will be reaching out for family support during the school year. Blessings for your continued support as we move Sacred Heart Cathedral School forward and create a new generation of inquiring minds who understand how to integrate knowledge and live our mission statement of educating hearts and minds for God. As we prepare for our final liturgy this morning and reflect on our year, I want to thank you for your support to continue to make Sacred Heart Cathedral School truly a family where we continually live our mission to serve others and reach for academic excellence. From the many volunteers who continually help at our school, to those who offer their assistance financially to continue to develop our school, I sincerely thank you for all that you do. Our children are the best; they are bright, articulate, kind and loving. However, most of all, they utilize their faith to make a difference in our world. There are so many stories I could share from a young student who gave away his money for a great cause, to the student who volunteered to spend his summer helping others. This community of families is the best. Everyone who visits our school comments on how friendly the students are and how happy they seem. That is such a tribute to you, our parents, and the teachers who work with our students daily. It is truly a special privilege to be part of this community. As we end our year, we end on a very special note. Our first-grade teacher, Miss Sarah Payne, will be married at our 8 a.m. Mass. The first-grade students are very excited as they are the honorary “attendants”. You are all welcome to join us at our liturgy. Cake will be served after the Mass in Ave Maria Hall. We will all miss Sarah as she begins her married life in San Diego. However, she promises to return to visit. There are a few other teacher positions that will be changing for the 2017-2018 school year. While we have interviewed and chosen candidates, the candidates are in process with the diocesan screening procedures. Consequently, I will write to you when all of the candidate positions are finalized. Session 1: 9:00 a.m. -12 p.m. Session 2: 1:00 p.m. – 4 p.m.
For more information or to register download the registration form. Both camps will have technically correct training in basic volleyball skills using age appropriate equipment. Instruction will be given in passing, setting, hitting and serving in a fun and safe environment. Players will learn new skills and improve technique in passing, setting, hitting and serving. Participants will also be trained in floor defense and team concepts. Fast paced camp focusing on hitting skills. Players must have a good grasp of basic volleyball skills to attend this camp. Download the brochure and registration form now!